Sherpa owned, among other things, one of the leading airline companies in the country. Ang Tshiring Sherpa, the aviation and hospitality entrepreneur who rose from humble beginnings to become one of the most powerful businessmen in the country, died in a helicopter crash on Wednesday, February 27. Ang Tshiring grew up in the shadow of Everest, in Pangom village, Solukhumbu, with his three brothers. So it was only fitting that the mountain would come to define his life and ambition, and bring him fame and fortune. But the mountains would also be the first to witness his death yesterday. Ang Tshiring was among six people, including Tourism and Civil Aviation Minister Rabindra Adhikari, onboard an Air Dynasty helicopter that crashed in Pathibhara, Taplejung, at around 1:30 PM. His youngest brother, Tendi Sherpa also died in a helicopter crash in 1998. The helicopter belonged to Air Dynasty Heli Service, one of the oldest helicopter rescue companies in Nepal, which Ang Tshiring himself founded in 1993. Air Dynasty was one of several ventures that established Sherpa and his brothers as the biggest names in Nepal’s aviation and hospitality industry. As the first generation of Sherpas to venture out of their villages, Ang Tshiring and his brothers made a name for themselves in Nepal’s nascent but growing ’90s tourism industry, which was then controlled by powerful families in Kathmandu. In the early ’90s, Ang Tshiring joined elder brother Sonam’s adventure travel company Thamserku, named after the peak in eastern Nepal. At Thamserku, Ang Tshiring learned the ropes of the travel industry, building contacts that would go on to serve him well when he began to branch out. This being the ’90s, multi-party democracy had just been reintroduced and the country was embracing the free market. The travel and tourism industry was growing but it was hamstrung by one crucial factor--a limited number of airlines. Thamserku was reliant on the state-run Royal Nepal Airlines, which had the most connectivity but limited flights. Ang Tshiring and brothers knew that they would have to step in and so, they started Yeti Airlines. Thamserku’s bet on Yeti paid off, and in 1998, Ang Tshiring moved to take the reins of the airline full time. In less than a decade, Yeti Airlines, which had started with a single Twin Otter aircraft, became the nation’s biggest domestic airline company. With its sister airline Tara Air, the two airlines together today command the largest network of flight routes throughout Nepal. This modest family business, which started with a travel company more than 30 years, has now grown to become one of the biggest names in Nepal’s travel and hospitality industry, with luxury resorts, airlines and expedition companies. Over the years, Sherpa also managed to build a personal relationship with Nepali politicians, particularly with Prime Minister KP Sharma Oli. 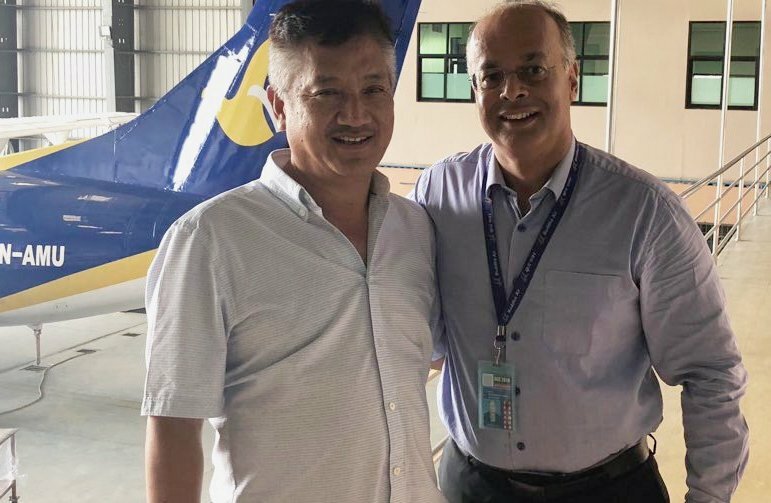 His close ties with Oli became evident when the prime minister embarked on an official state visit to Beijing last June on Himalaya Airlines, the licence for which is owned by Sherpa. Sherpa’s business associates say there were talks between Oli and Sherpa about building a view tower in Jhapa, Oli’s home district, as well as a cable car in Pathibhara, Taplejung. Those who worked with Ang Tshiring, including his competitors in the aviation industry, remember him as an industrious individual who worked tirelessly not just for his own company but also stood by the aviation industry in times of crises. He, along with Buddha Air’s Birendra Basnet, were among leading figures from Nepal’s aviation sector who resisted and ultimately reversed the government’s decision to enforce stringent rules regarding the use of ramp buses from a single company during the early 2000s. Industry insiders say this was unfair to domestic airlines, who would’ve benefited more from having their own individual buses, rather than relying on the services of an external company. Ang Tshiring is survived by his wife and two sons, one of whom is a pilot with Yeti Airlines.